there is no limit to what can be created. Many times the materials themselves dictate what the outcome will be. One goal in the creative process is not to distort the recycled object so that it may still be recognized. hand-crafted one at a time so that no two are alike. Each piece is signed and numbered by the artist. Eco-Art is available at Tim’s gallery and studio located in Finger, Tennessee; at regional art and craft shows; in the gift shop of the National Ornamental Metal Museum, Memphis, Tennessee; at the Mississippi Crafts Center, Ridgeland, Mississippi; and in the Corinth Artist Guild Gallery, Corinth, Mississippi. 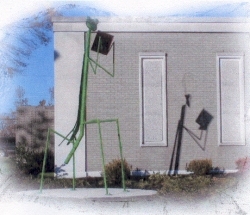 Eco-Art pieces on permanent display may be seen at the Jackson-Madison County Library in Jackson, Tennessee; at The Children’s Museum of the Shoals in Florence, Alabama; and in the Children’s Learning Center, “My Big Backyard,” at the Memphis Botanic Gardens in Memphis, Tennessee. Thank you for visiting Eco-Art Creative Metal Recycling! Copyright © 2004-2012 - Eco-Art Creative Metal Recycling.